Choosing the right DMS is a big decision. You want functionality, value and 100 percent of your data. But you also need great training and support to make it all work. This eBook provides the best practices when contemplating such a critical transition. 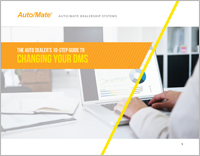 At a time when many dealers are considering a new DMS, it’s crucial that you’ve done your due diligence and know what to expect during a DMS switch (or as some dealers like to call it, a “heart transplant”). This eBook is full of lessons learned from dealers who have successfully made the switch and insights from top industry experts.